"What was it that enabled a small Italian market town by a ford on the River Tibur to conquer the known world? 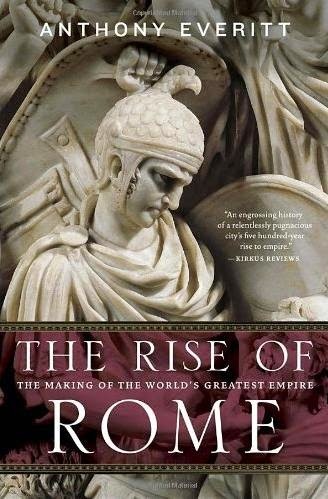 I seek to answer these questions by telling the story of the rise of Rome." Why are so many people so interested in the history of Ancient Rome? Well, that is easy. Rome has greatly influenced western civilization, and especially the form of government and the rule of law in the Western Europe and in the United States of America. The founding myth of Rome puts Aeneas's two grandsons in a basket in the Tiber River. They are eventually suckled by a wolf. Romulus kills Remus, and then founds the Roman tribe on and around the seven hills of Rome, where it was possible to ford the Tiber River, making it an ideal spot for a trading town. In the past few years I have pursued a course of private study of Roman history, and I am sorry I did not do it earlier, and that it is no longer part of the education of all students. The perspective the past offers on the present is invaluable. There truly is nothing new under the sun. I encourage everyone to widen their education to include the history of Ancient Rome. Part 1 - Legend, the story of the founding of Rome and the rule of the city-state under kings. Part 2 - Story, the conquest of Italy and the growth of the Roman system of government. Part 3 - History, the Roman Republic and its growth as a Mediterranean power. This is not a comprehensive history, but an introduction to the history of Ancient Rome covering the eras from 753 B.C. (the purported founding of the village of Rome) to 100 B.C. (the first Civil War between aristocratic forces and plebeian forces) which was the beginning of the end of the Roman Republic. "It is a taster of the treasures in store for anyone who wishes to dig deeper into the subject." Actually, the author jumps forward, past the limits he first set for his book, and explains the second Civil War too, between Julius Caesar and his plebeian forces, and the Aristocratic forces, which lead to a partial democracy. We also get a peek at Octavius/Augustus and Mark Antony who fought the third Civil War, leading to a total autocracy. Overall, the author covers nearly 1000 years of Roman history. Julius Caesar Crossing the Rubicon to Begin a Civil War Against Pompey, 49 BC. The Rubicon is a river that was the line over which no Roman Commander could bring his army, because it was seen as a provocative threat against the city of Rome. When Caesar crossed it, he cast his die, took his chance that he would be victorious against the aristocrats of Rome, including his former son-in-law, Rome's most powerful man, Pompey. Caesar was victorious, and Pompey ended up beheaded in Egypt on the order of Cleopatra's brother. "...reflect on big themes and analyze the development of Roman politics, warfare, and society." One of the big themes is his explanation of why the Republic fell, and why the Western Empire eventually collapsed. Luxury and wealth that came from conquering decadent lands corrupted the aristocracy and thus the State. Gold, slaves and decadent examples corrupted the modest, hardworking, patriotic warriors who were the original Romans. This corruption led to civil wars and eventually to the Dictator/Emperor, which opened up the strife around succession and privilege that eventually weakened the Empire. The author also spends much time analyzing the big personalities who shaped Roman society and its development: Sulla, Marius, Pompey.... There are many reference maps in the 500+ paged book, along with some images, a timeline, and lots of Sources. Pompey was wealthy from all the riches he took from lands he conquered for Rome. He used his money to build public buildings in Rome, like this theater, the first theater in Rome where people could have some covered seating. The senate sometimes met there, and it is where Julius Caesar was assassinated. The Punic Wars are not ignored, since they left Rome as rulers of the Mediterranean, after their eventual destruction of Carthage, the Punic Kingdom that had controlled sea trade for hundreds of years. "Romans were fighters and spent much of their time battling with their neighbors..."
"Ambitious men had to combine the art of the public speaker at home [politics] with that of the general in the field if they meant to attain power." Glory, empire, power, wealth...the grandiose history myth the Romans perpetuated about themselves, that they were descended of the Trojans and lead by Aeneas, with Romulus and Remus being the grandsons of Aeneas, led many Romans to expect grandiose things for their future, at the expense of their neighbors who had less exotic origins. Those grandiose things were to be obtained through "war, death, and blood". The Punic Wars were between Rome and Carthage. The 2nd Punic War is the one most people know at least a little bit about, since it is the one in which Hannibal Barca brought his army from Carthage controlled Spain, through France (Gaul), and over the French Alps into Italy, where he remained for 18 years terrorizing and pillaging and killing thousands of Italians. This drawing purports to show Hannibal's elephants crossing the Rhone River. According to historians, the elephants refused to enter the river, so the men built rafts to carry them over. But the elephants would not go on the rafts. So the men decorated the rafts with soil and plants and tried to get the elephants to step onto the rafts thinking they were ground. It didn't work. Finally they got a female elephant who was in heat and forced her into the water. The bull elephants ran after her and they all managed to get to the other side, but most of the elephant handlers were killed in the stampede and struggle. Aristocratic military commander Sulla infamously posted a hit-list of his enemies in the Roman Forum, after he became dictator of Rome, and offered the dead man's possessions to anyone who presented the guy's severed head to the authorities. There were many takers. Julius Caesar was on one of the lists, but he managed to escape to the Near East, later to return, and eventually become a dictator himself. Those were the years of various civil wars. From Anthony Everitt, the bestselling author of acclaimed biographies of Cicero, Augustus, and Hadrian, comes a riveting, magisterial account of Rome and its remarkable ascent from an obscure agrarian backwater to the greatest empire the world has ever known. Emerging as a market town from a cluster of hill villages in the eighth and seventh centuries B.C., Rome grew to become the ancient world’s preeminent power. Everitt fashions the story of Rome’s rise to glory into an erudite page-turner filled with lasting lessons for our time. He chronicles the clash between patricians and plebeians that defined the politics of the Republic. He shows how Rome’s shrewd strategy of offering citizenship to her defeated subjects was instrumental in expanding the reach of her burgeoning empire. And he outlines the corrosion of constitutional norms that accompanied Rome’s imperial expansion, as old habits of political compromise gave way, leading to violence and civil war. In the end, unimaginable wealth and power corrupted the traditional virtues of the Republic, and Rome was left triumphant everywhere except within its own borders. Everitt paints indelible portraits of the great Romans—and non-Romans—who left their mark on the world out of which the mighty empire grew: Cincinnatus, Rome’s George Washington, the very model of the patrician warrior/aristocrat; the brilliant general Scipio Africanus, who turned back a challenge from the Carthaginian legend Hannibal; and Alexander the Great, the invincible Macedonian conqueror who became a role model for generations of would-be Roman rulers. Here also are the intellectual and philosophical leaders whose observations on the art of government and “the good life” have inspired every Western power from antiquity to the present: Cato the Elder, the famously incorruptible statesman who spoke out against the decadence of his times, and Cicero, the consummate orator whose championing of republican institutions put him on a collision course with Julius Caesar and whose writings on justice and liberty continue to inform our political discourse today. Rome’s decline and fall have long fascinated historians, but the story of how the empire was won is every bit as compelling. With The Rise of Rome, one of our most revered chroniclers of the ancient world tells that tale in a way that will galvanize, inform, and enlighten modern readers. What was Ancient Rome like? Here is an amazing simulation of the city in the 2nd century A.D. The book is published by Random House. A Smaller History of Rome by Eugene Lawrence, from the founding to 1st century A.D.
History of Rome by Livy, from the founding to the 1st century A.D.
History of Rome by Tacitus, from Augustus in 14 A.D. to 70 A.D.